News is everywhere nowadays as it seems. No matter where you look news is readily available anytime of the day from the news on TV, to social media feeds, email newsletters and so on. 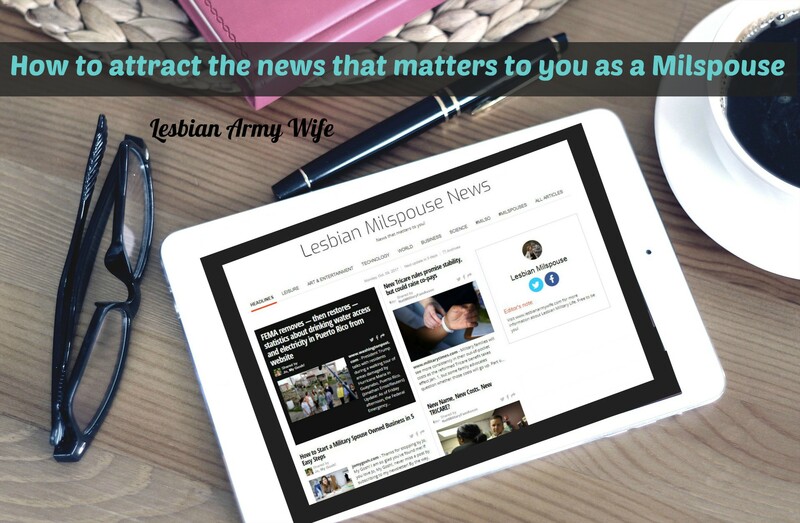 How do you attract news that matters to you and that is relevant to your life as a milspouse? We live in such as fast pace of life, with new technology, it seems as everyone who has a phone is now a reporter and can share news as it happens live. 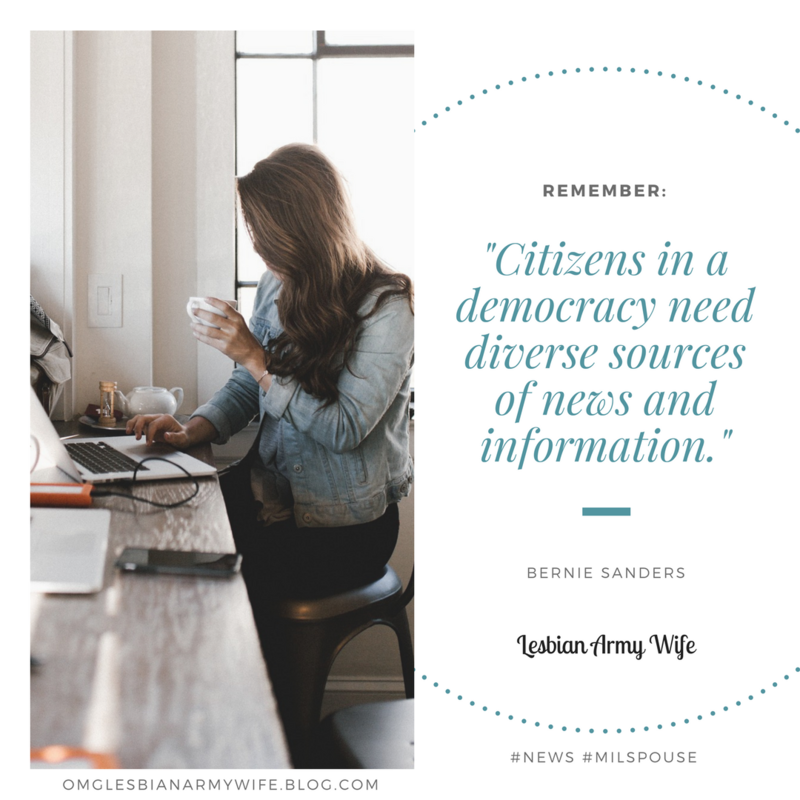 I believe whether you’re a military spouse or just the plain civilian news matters. As people as humans we are social by nature we want to know what’s going on in our communities and world. We hear news on the radio, the television and we hear news from those we talk to. News is the information and ideas that keep the fabrics of society together. I think sometimes news is scary but is informational. Collectively news provides you with need to know about topics for your life. Information and news is abundant everywhere we look. Sometimes it’s good to take a step back and realize what tools we have in front of us. We need to be mindful of the way we receive and consume new information. We can Google anything from, now it seems, from our ailments to researching our ancestry or we can search for a YouTube tutorial to help with everyday life. How do you figure out what is important to you? Ask yourself, what topics or interests do you want to know about? Remember, everybody blogs today and everybody’s opinion matters. However, is this the right source for your news information to come from? Honestly, it really depends on if the blog is reputable or not. Although, blogs are really not the ultimate choice when it comes to selecting news. Research different news site or outlets. See what others are saying about your sources. Make the best judgement when it comes to where you look to for news that matters to you. Find reliable sources that you can depend on all the time. Whether it be new sources like your local channels or cable channels like CNN or Fox make sure your news comes from the most reputable honest and truthful. Keep in mind not all media outlets are truthful and unbiased. When you do narrow where you want your news to come from choose various sites. Choose news outlets from around the world get the full story. World news will give you a better perception and facts on a topic or headline you are reading about. We live in an ultra modern, ultra fast pace life with social media everywhere we look. It’s important to hone in on what news matters to you. Where are you favorite places to get news that matters to you? Leave a comment.